This ws can be used as practice or consolidation for daily routines. 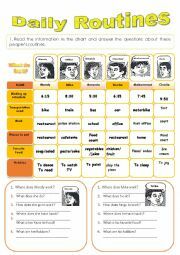 It has a chart with information of 6 people´s routines. I made it for my adult esl beginner class at night school. 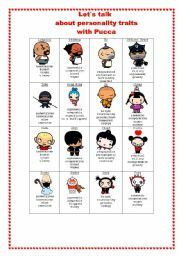 This is a ws to teach personality traits, description of characters and jobs. This ws can be used when teaching traveling plans, turism or simple present in context. 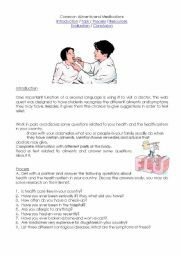 This could be adapted to be used as a webquest or a worksheet about diseases ang going to the doctor situations. 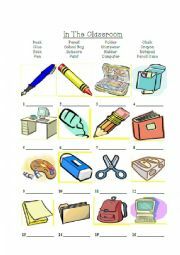 THIS WS CAN BE USED TO PRACTICE OR CONSOLIDATE SEVERAL BASIC TOPICS SUCH AS PERSONAL INFORMATION, NATIONALITIES, SPELLING NAMES, HOBBIES AND OCCUPATIONS. THIS WS COULD BE USED AS A CONSOLIDATION ACTIVITY WITH CHILDREN OR BEGINNERS. This is the second part of personality traits. You can use it for some topics like jobs, traits and teaching character and plot. 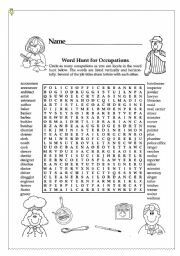 This is a fun to do activity it could be use as a game or as the wrap up activity after covering the topic of jobs, careers and lifestyles. I hope you like it, my students loved it! These are some action verbs that you can cut out and use them in order to play with the students and reinfornce verb tenses. THIS IS A READING COMPREHENSION ACTIVITTY THAT COULD BE USED TO TEACH READING STRATEGIES OR AS A WRAP UP ACTIVITY AFTER FINISHING THE HOLIDAYS AND CELEBRATIONS UNIT. I HOPE YOU LIKE IT! This is a fable with a good moral to be used when teaching fables, simple past or personality traits. YOU CAN USE THIS PPP TO TEACH PAST TENSE, MORALS, VALUES AND THE TOPIC OF FAIRY TALES OR FABLES. 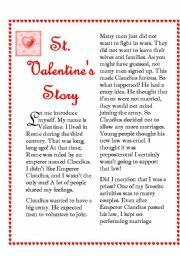 MY STS LOVED IT BECAUSE OF THE MORAL AT THE END. This is a good aid to cover the topic of conditional sentences, it has plenty of examples and the theory is well- developed. I hope you like it! This ppp could be used when introducing some topics such as descriptions or jobs. This ppt is a jeopardy game that could be used as a consolidation activity after covering a technology unit or after teaching electrical appliances and computer parts. 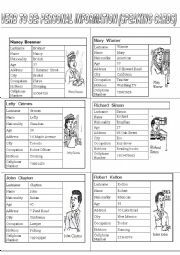 This is a very useful ppp to cover different topics, you can use it for fairy tales to teach past tense, or to teach literary elements or to describe characters. This ppp is great to teach the telecomunications topic. This is a very nice power point to develop the topic of Holidays and Celebrations, you can adapt it to your brackground. 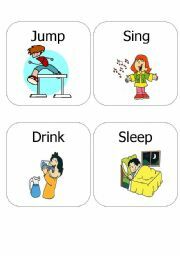 It has lots of vocabulary exercises and also speaking activities.